I just heard this quote from my Source, and I really hope that it is true. If a mere 1% of the Sahara Desert were covered in solar panels, enough energy would be generated to power the entire world. Man, I wish that I could prove that! I mean, I probably could with a little study, then a little math, but if it is true, then all that desert out there in the Sahara that does nothing but fill with hot sun could be used for some eco-friendly power! 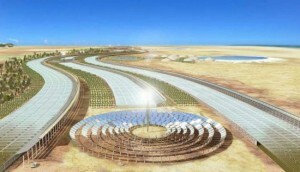 In fact, a massive solar farm is planned to be constructed in the Sahara, and should be finished sometime in the next five years. It is slated to go until 2050, with a small portion of energy going to European nations, and then increase as the technology for transmitting energy is improved. Yeah, there is sort of a big “if” in that last sentence. I realize that sometimes I write articles about fake tech that somehow leaks to legitimate sources, and I hope that this is one of those times. As it is, this illustration looks like a still shot from a little-seen Matthew McConaughey film Sahara. If you can really fill one percent of Africa’s biggest desert and gain enough power the world, than let’s fill ten percent. Heck, fill it all up man! I’m sure that the situation is more complicated than that, though. Wearable Power – Paper Battery..